If you’ve been a believer in Jesus for very long, no doubt you’ve experienced the dilemma of unanswered prayer. I believe no one is exempt from it. Yet many turn away from God because of it. In my daily conversations with Him, the topic often comes up. I’m always the one that brings it up, of course. I have been walking through a season of unanswered prayer that has lasted many years. Those of you who know me, know I have had ongoing health issues for over twenty years. I have had more people pray for me than I can possibly remember – even people that are well known for their healing anointing on an international level. As an intercessor, I strongly believe in the power of prayer. I direct a healing ministry that has seen many, many healings and miracles over the past eight years. I have personally prayed for people and seen them get healed. I even pray over myself every day. I believe it is God’s will for everyone to be healed (1 Peter 2:24), just as it is His will for everyone to be saved (2 Peter 3:9). But everyone doesn’t get saved, and likewise, not everyone gets healed. There are many reasons for this, too many to mention in this short article. 1. I believe God’s Word is true and He cannot lie. Just because it hasn’t happened yet doesn’t mean it won’t. I refuse to give up believing and pressing in for my healing. 2. I believe God promises to work all things together for my good. (Rom. 8:28) Though the enemy is the one who brings sickness and infirmity, God’s plans for me are bigger and greater than any plans the enemy may have. He has already brought much good through this trial – I am growing in my faith; I have greater compassion for the sick and suffering; I have drawn closer to God because of my great need for Him; I am growing in patience; and these are just a few! 3. When other believers say or imply things like, “You don’t have enough faith,” or, “You must have sin in your life,” (which are things we are often taught and can, at times, be true) I have had the opportunity to exercise grace and forgiveness, and to go before the Lord to see if what they are saying is true. Twenty years gives one abundant time to do a lot of soul searching! 4. I am learning the art of waiting on God. For more on what this means, see my article, The Crucible of Waiting Upon God. God’s ways and timing are not like ours. He is more interested in the process than in the final destination. For Him, it is always about relationship, not our personal comfort. He is always good, so when He allows pain to touch our lives, His purposes for doing so are always redemptive. When we don’t understand His ways, we can always trust His nature and character. 5. While I am in this season of waiting, I am learning the importance of taking better care of my body. It’s sad, but so often true, that we take our good health for granted, until we lose it. I am finding natural alternatives to help heal and restore my body that have helped tremendously. I am also learning to eat healthier. There is so much sickness that can be prevented just by changing our diets. 6. I continue to pray for others to be healed. It doesn’t make sense that He wouldn’t want us to have what He has already paid for. As I see many of these prayers answered, it stirs my faith anew to continue to stand firm and believe for my own. 7. I often think about the testimony I will be able to share when my healing is complete. I believe that testimony will encourage and empower many others who have been waiting for years to receive their own healing. What a glorious day that will be! If you’re walking through a season of unanswered prayer, how are you choosing to respond? 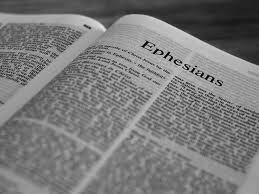 The first chapter of the book of Ephesians contains some of the most powerful truths in the Bible. It reveals great insight into who we are in Christ, and what we have been given as a result of being joined to Him. Meditating upon these truths over several years has been life changing for me. Since God is no respecter of persons, I know it will impact you powerfully as well. God provides grace for us, the power to live this life to which He has called us. Through the enablement of His indwelling Spirit, we can do all things that He requires of us. Shalom literally means, “security, safety, prosperity, bliss; the tranquil state of a soul assured of its salvation through Christ, and so fearing nothing from God and content with its earthly lot, of whatsoever sort that is.” This shalom is ours because of what God has done for us through Jesus. Yet this is just the beginning of what we have been given! Paul goes on to say that God has blessed us with every spiritual blessing in heaven through Christ. Everything that Jesus is, and has, is ours. We are joint heirs with Him. (Rom. 8:17) This includes being conformed into His divine image and nature. (2 Peter 1:3-4) Since God is not bound by time like we are, He sees all of eternity as one continuum. He sees us as already perfected because He sees the end from the beginning. Through Christ we have wisdom, for He, Himself, is our wisdom. (1 Cor. 1:30) We have revelation through His Spirit, who guides us into all truth. (John 16:13) He has given us power, manifested through the gifts of the Spirit. We have been given His nature which is seen when we bear the fruit of His Spirit. There is absolutely nothing He has forgotten, excluded, or withheld from us that is of, or from, Him. We were chosen because of His love for us. (1 John 4:19) Knowing before creation that we would sin, He made provision, through Jesus’ sacrificial work on the cross, for our sanctification. Jesus was slain from before the foundation of the earth. (Rev. 13:8) All of this was planned in advance because of His desire for relationship with us. He sees us as holy and without defect (Song of Sol. 4:7) because of the blood of Jesus. In just three verses, we get a glimpse of the great love that God has for us, His beloved children. I encourage you to meditate upon these truths and pray that as you do, He will stir within your heart a greater love for Him than you have ever known. Since He has given so much to us, He deserves all that we have to give to Him.